RDS Technology will be displaying its wares at the Hillhead 2016 exhibition in the UK, which is due to take place at the end of this month (June). On show at its stand will be the LOADMASTER α50, LOADEX 100, LOADMASTER α100, iSOSYNC and WEIGHLOG α10. LOADMASTER α50, the enhanced colour touchscreen replacement for the LOADMASTER 8kiX is an on- board weighing system for larger loaders which will be making its world de´but at the Hillhead exhibition. The LOADMASTER α50 is designed to help increase loading efficiency, cut vehicle movements on site and ensure lorries are correctly loaded first time. LOADEX 100 is a retrofittable scale installed on both tracked and wheeled 360° excavators and material handling machines to weigh the amount of material in the bucket, grab or clamshell. LOADMASTER α100 is an on-board weighing scale for wheeled loaders. 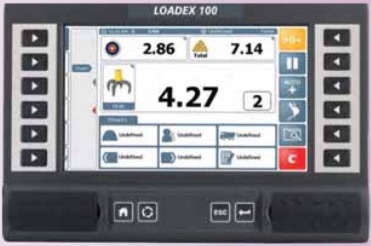 A CAN based system combining cutting edge sensor technology and signal processing techniques, the LOADMASTER α100 is designed to provide precise and consistent bucket weight information and to emphasize the gains in productivity and profitability that can be achieved with such technology. LOADMASTER α100 is designed to operate within the fastest loading environments and toughest of conditions, to reduce cycle times and maximize tonnes per hour performance. iSOSYNC enables control of the loadout operation and inventory, productivity and traceability management. The software can be used with either LOADMASTER α100 or LOADEX 100 and allows the rapid transfer of job information from a central computer to the loader or excavator and the resultant load information is sent back to the PC upon completion. For smaller loaders and skid-steers, RDS offers the WEIGHLOG α10, which also benefits from a colour touch screen display. This instrument is designed to be a user friendly on-board weighing system which provides accurate and consistent bucket and total load results, meaning stock management and check-weighing operations can be controlled more effectively. RDS Technology, a Topcon Positioning Group company, supplies over 100 original equipment manufacturers worldwide with custom solutions, as well as supplying standard ‘retrofit’ products through a network of specialist independent distributors in over 30 countries where customer service is the highest priority. Headquartered in Minchinhampton in the United Kingdom, RDS pioneered the use of electronics for agriculture and continues to lead in other sectors of mobile machinery.